Southington resident MaryAnn Kjellquist - as are many caregivers - was worried about her elderly mother. Angeline Giza, 90, was having mouth problems including dry mouth, sores and cavities, and she suspected that her prescription medications could be the cause. Giza read in the newspaper that a geriatric pharmacist was available for home visits in Southington and made the call. At a convenient time, the mother and daughter met at the home with Sean M. Jeffery, PharmD, CGP, FASCP, AGSF, director of Clinical Pharmacy Services, Integrated Care Partners, Hartford HealthCare. To Kjellquist’s surprise, Jeffery’s focus at first was not on the medication but on her mother’s total well-being including her health history, her home’s safety and her quality of life. He then learned more about her prescriptions, how she manages them, if she organizes her own pill box, how and when she takes them, use of her inhaler and more. “He took all aspects of my mother into account,” Kjellquist said. Giza, who was a nurse at the Hospital of Central Connecticut, Bradley Memorial campus - was well versed about managing medication, including her own. However, Jeffery researched side effects and interactions on his laptop while he was still at the home. Within one week, he emailed a full report and Kjellquist brought it to her mother’s physician at the next visit. The medications were adjusted with one being phased out. “She still has dry mouth but there is a big difference. His plan worked so far – I’m very impressed,” Kjellquist said. This in-home geriatric pharmacist service is offered by Hartford HealthCare Center for Healthy Aging through a Main Street Community Foundation grant. Southington residents who may benefit from this service include those who are unclear about their medications, worried about interactions and/or having difficulty remembering to take them. For more information or to schedule an in-home geriatric pharmacist visit, call 1.877.424.4641.
and meeting the older woman’s needs. Fenner and her sister opened their homes for three-month time periods in an attempt to juggle responsibilities but the arrangement only added to the stress. When their mother, Barbara, finally moved full-time into Fenner’s home, Fenner realized she was in over her head and needed help fast. She turned once again to Hartford HealthCare Center for Healthy Aging, which she had connected with through her physician when her mother was first diagnosed three years ago. Dementia specialists Patty O’Brian, CDP, and Michelle Wyman, LSW, CDP, recommended the five-part series, “Dementia and Caregiving: Focusing on the Person while Understanding the Disease Progression,” that was held at Southington Library. Fenner and her brother both attended to learn how to best communicate with and relate to their mother to make life a bit easier for everyone. “It was the best thing I ever went to. If it wasn’t for that program, my brother and I would be clueless. It was such a help with how to deal with mom and we’re using many of the techniques we learned in class,” Fenner said. Of the numerous suggestions that she has incorporated into life one of the most effective has been establishing a daily routine. 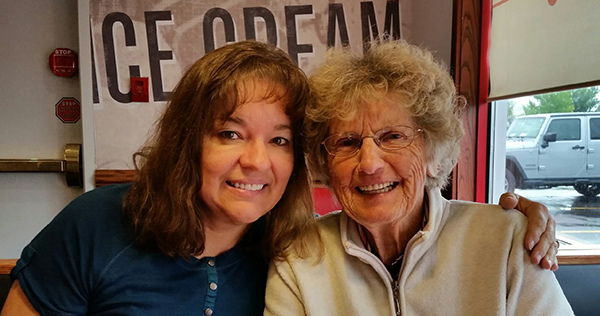 As her mother’s dementia progresses, Fenner has continued to turn to the Center for Healthy Aging for additional resources. She said that at least once each day she refers to the Dementia Caregiver Resource Guide, a free comprehensive 80-page book that the Center for Healthy Aging distributes, to learn how best to respond to a situation. Dr. Sowmya Kuratkoti, a geriatrician, evaluated her mother and her needs, while working in conjunction with the older woman’s primary care physician, Dr. Letterio Asciuto. Barbara recently began attending adult day center at Mulberry Gardens of Southington, which gives Fenner the time to work from home uninterrupted and gain some respite four hours each day. She knows the situation will only get more complicated over time and said her mother will eventually need full-time care at a memory care community. Throughout the process she will continue to seek the guidance of the Center for Healthy Aging professionals. “It has truly been a godsend,” she said. For more information on Center for Healthy Aging services and upcoming events, call 1.877.4AGING1/1.877.424.4641. I was a visiting nurse for the VNA for elderly individuals for years so I was very familiar about services for the aging population. I like everything you guys are doing - there is a lot of helpful information and a friendly environment. These days for me everything out of my house is easy but it is great to see everybody that I got to be friends with at the Center for Healthy Aging. There is a lot of information, the socialization is good and there is a sense of community. Everybody seems interested in everybody and you feel like you belong. Dear Joseph, I can’t begin to tell you how much our meeting with you meant to my mother and myself. How comforting it is to know that there is assistance for seniors and their caregivers. You were very knowledgeable and we appreciate the time you spent with us in explaining the program in great detail. We thank you for your thoughtfulness and kindness. It’s so greatly appreciated. Joseph Zuzel is the resource coordinator for Hartford HealthCare Center for Healthy Aging at Windham. I am so happy with the services from the Center for Healthy Aging and resource coordinator Joe Zuzel. He was able to connect me with transitional care nursing services and Nick Arsenault (RN). I was so impressed with the way that Nick interacted with my dad during his in-home assessment. He didn’t make my dad feel like he was disabled or inferior. He validated his feelings and followed his lead but also shared his concerns, like pointing out that my father had extra bottles of medications and some that were mixed. I feel so relieved with the services that were put in place by Joe and Nick. Nick and the resident service coordinator were able to get people to come to my father’s home every day. He has an occupational therapist, physical therapist, home companion who cleans and does laundry, a personal care attendant helps him bathe and shower and a nurse that helps him manage his medications. It seems like there is a different person who comes to the house to fulfill a different need every day.